The Mighty Boosh is an award winning British comedy show created and written by comedians Noel Fielding and Julian Barratt. Also starring regular cast members Rich Fulcher, Michael Fielding and Dave Brown. Developed from 3 stage shows appearing at Edinburgh & Melbourne Comedy Festivals, The Boosh has since produced a 6 episode radio series, 3 television series (a total of 20 television episodes) for the BBC, which have aired worldwide and 2 sell out live tours of the UK, as well as performing exclusive live shows in the United States and Australia. 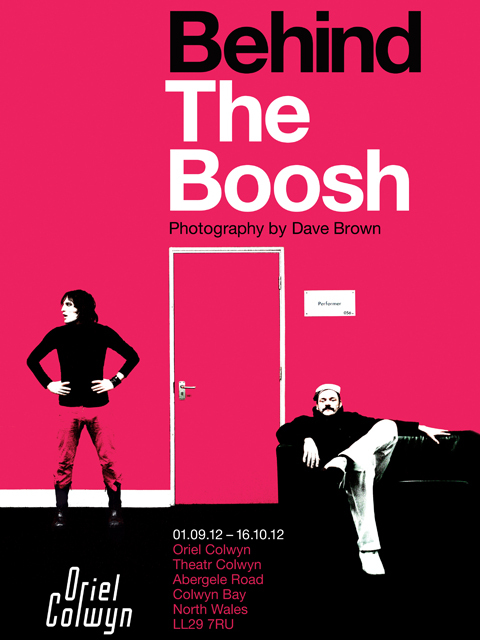 Dave Brown has been part of The Mighty Boosh since its conception in the late 90s. Over the years he has been involved in many aspects of the show from designing DVDs, books and merchandise to choreography, music and playing many characters in the show itself, most famously Bollo, the Gorilla. Dave’s also had a camera in his hand from day 1 of the show. These photographs of his fellow cast members and good friends span over 12 years. Photographs from early live gigs, filming the TV shows and behind the scenes whilst on tour. They provide a unique insight into the lives and characters of The Mighty Boosh collective. Dave is alone in his photographic documentation of the show. He has reduced his extensive archive to 46 of his personal favourites, many being shown for the first time, to tour as an exhibition. Behind The Boosh exhibited at Oriel Colwyn between 01 September – 16 October 2012.